So much food and so little time to post of late. Work, life and projects have been interfering with food blogging of late but such is life. Nonetheless, we always have time for food and this was a flavorful weeknight meal. Sometimes I get tickled with my friends. 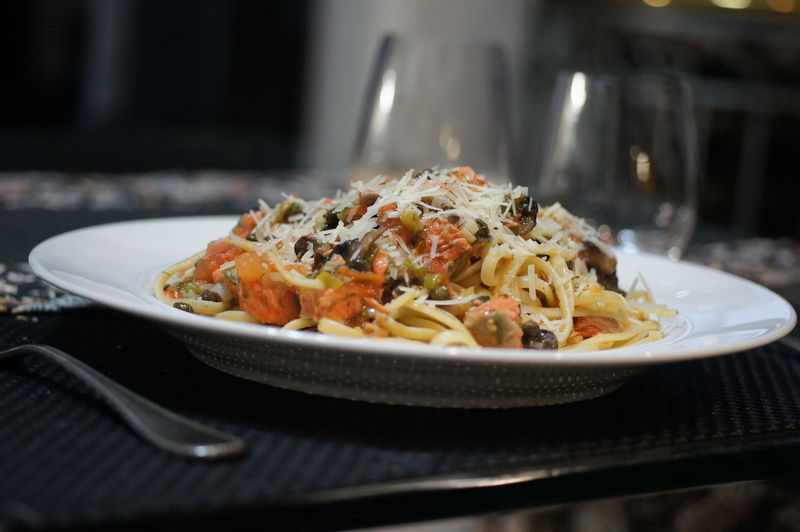 Many of them don’t look at the blog because they think the food I cook is too complex. Sadly, they won’t even try these recipes unless they come over for dinner. 😦 Now, like most of us, I do like to cook and play with my food. I have tons of cool kitchen toys that I have accumulated over the years and am still accumulating more (I can’t wait to get my molecular gastronomy packages). But some of my friends forget that I really do work and don’t have time to spend in the kitchen all day long cooking dinner. Now granted, some of the dishes I cook are quite complex, i.e. sous vide cooking, but those dishes are fixed on the weekends when we have all day long to cook and play with the food. Like everybody else, during the weeknights we want something quick, tasty, filling and generally healthy. As a result, most of the recipes posted on this blog are cooked within 30 – 40 minutes, like this one. We hope you like it. Bring a large pot of water to a boil and cook pasta. Heat oil in heavy large skillet over medium-high heat. 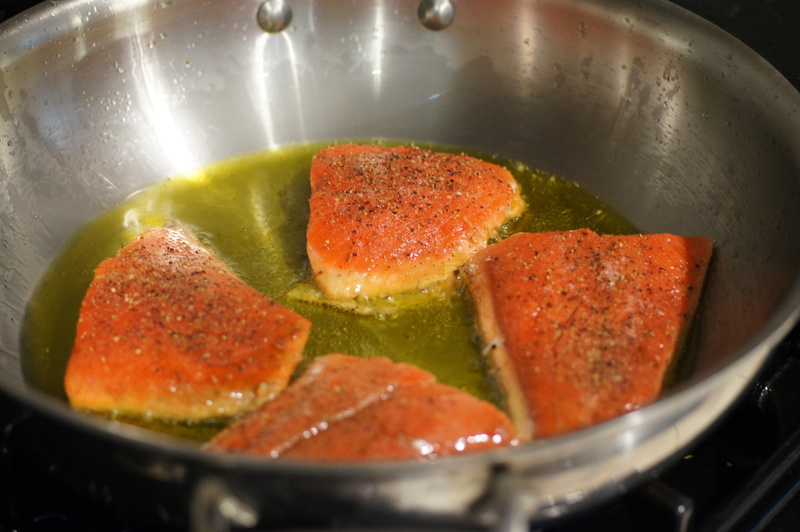 Season salmon with salt and pepper and add to the skillet. Sauté salmon until just cooked, roughly 3 minutes. Remove salmon to a cutting board. 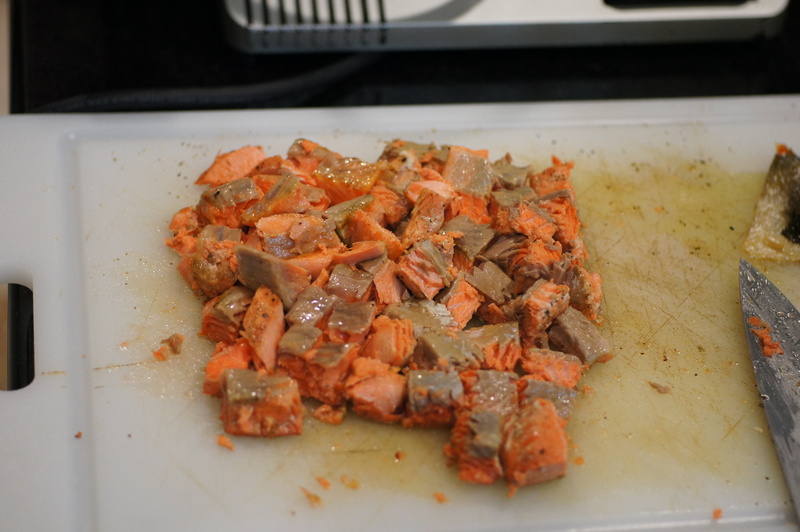 Remove skin and cut into 1/2 – 3/4 inch chunks and set aside. 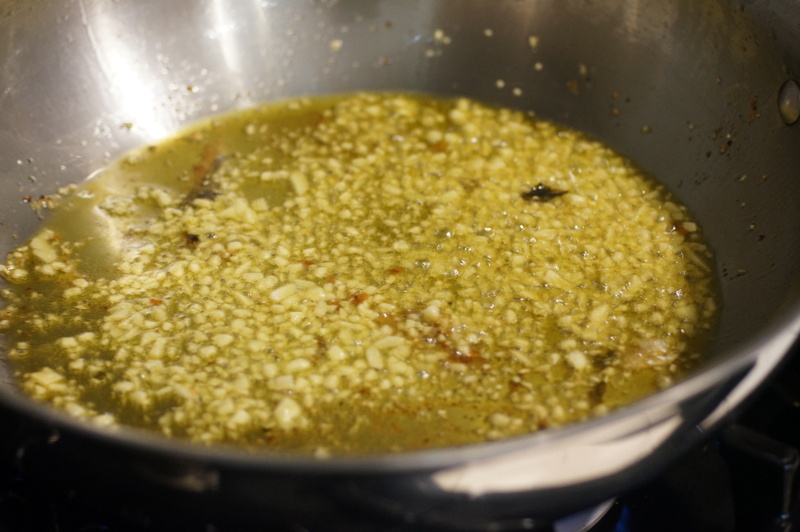 Add garlic to same skillet and sauté until fragrant, roughly 30 seconds. 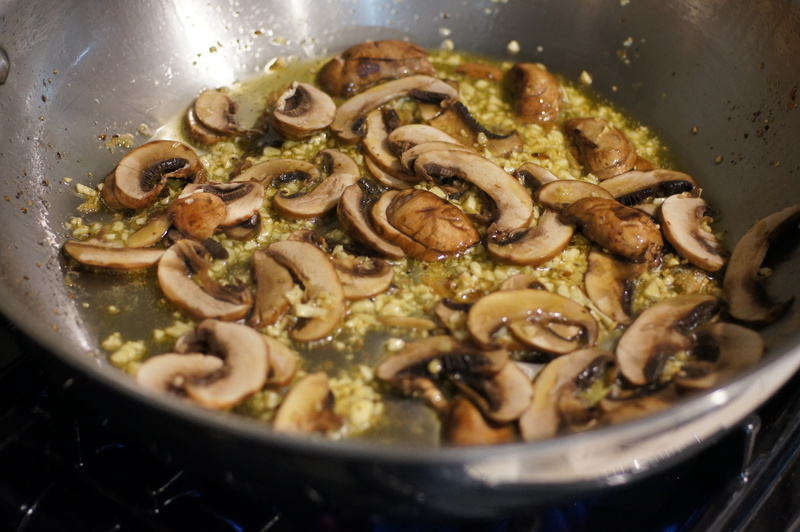 Next, add the mushrooms and sauté for roughly 2 minutes. 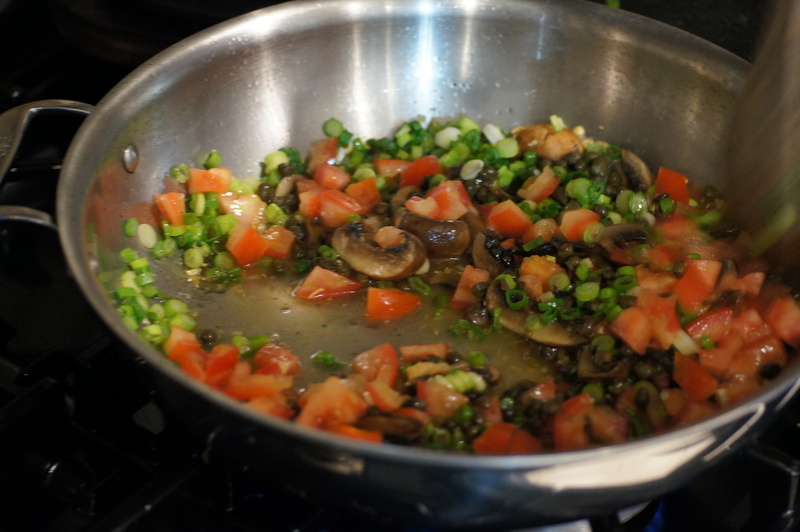 Now, add the scallions, tomato, wine and capers. Cook until mushrooms are tender and the tomatoes start to break down, roughly 5 minutes. 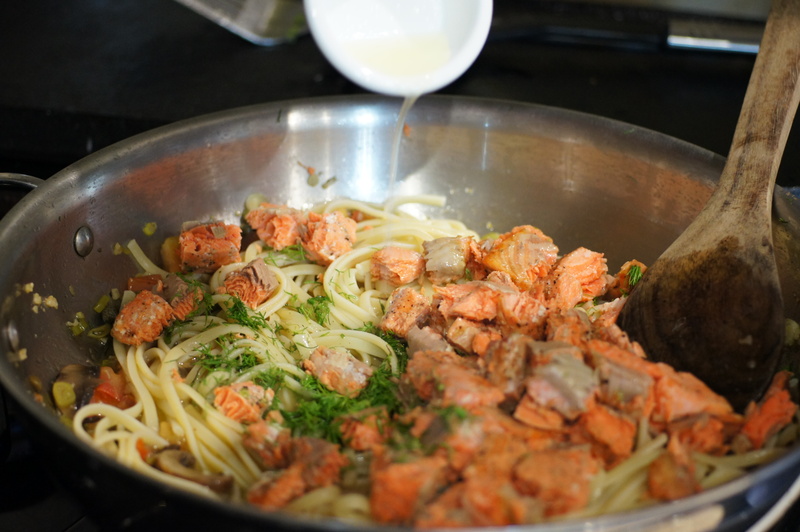 Add pasta, fennel fronds, lemon juice and salmon. Toss to incorporate. Season with salt and pepper. Serve and enjoy! If desired, sprinkle with some grated parmesan cheese. Lovely. We are having grilled salmon, spinach and new season Wicklow potatoes. This looks like a great alternative. Thanks for the nice comment, Conor. We love to grill and sauté salmon but we needed a change of pace so this was it. If you give it a try, let us know what you think. I HAVE to try this. It looks amazing! I’m sure I will 🙂 I love salmon. Great way to use the salmon, will be trying this soon. Hi Dennis. Thanks for dropping by and your nice comment. Let us know how you like it. 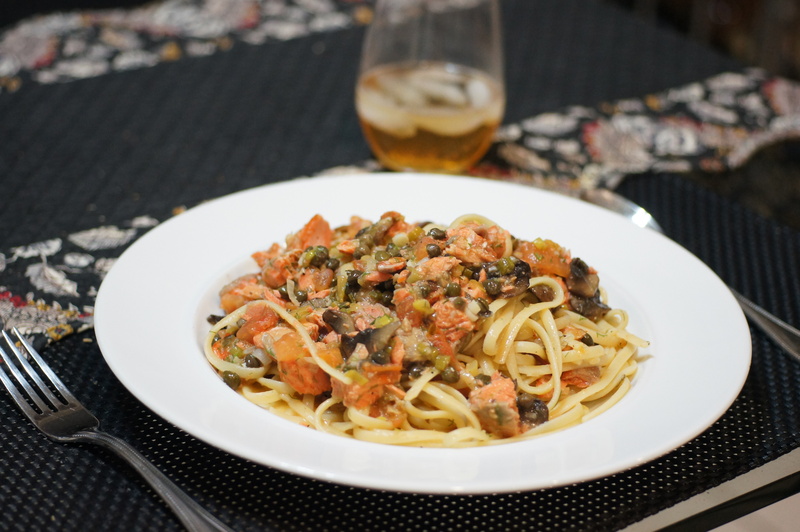 Pasta with salmon is such a great dish and your recipe, Richard, sounds terrific. Your opening photo really says it all. YUM! Thanks, John, for your nice compliment. I’m glad you liked it. I’m glad to hear that some of the food with which you are familiar is available in Korea. Let us know how you like it. Good choice. The capers are a nice touch. I was just looking at some yesterday. I saw some smaller ones, and some that were a little larger. Is there any preference? Thanks for dropping by and the nice comment. Baby Lady says any caper will do and not to worry about size. Capers are categorized and sold by their size, with the smallest sizes being the most desirable. There are non-pareil (up to 7 mm), surfines (7–8 mm), capucines (8–9 mm), capotes (9–11 mm), fines (11–13 mm), and grusas (14+ mm). We actually prefer the non-pareil, meaning no parallel, i.e nothing compares, and the surfines. Thanks for the information. It looks like I have some new items to look for on my next trip to Toronto. I may have to start looking online to order certain things which are difficult to get where I live. Good smoked salt is also one i”m in pursuit of .